New York streets became models’ runways for Fashion Week, footballs are flying, and the President helped put the kibosh on a burning Koran. All the while, your Six-Word Memoirsgave us a reason to look past the insanity. Here are six six-worders we love from the week ending September 10. Click on each author’s name to check out more memoirs. Most Universal: “Smiles are much prettier than scars.” —CarlyLaurenx3, from our new six-word project, Six Words on Pain & Hope, with the nonprofit, To Write Love on Her Arms. Most Melodic: “Couldn’t cope, so I wrote songs,” Aimee Mann’s Six-Word Memoir, who turned 50 on September 8, 2010. 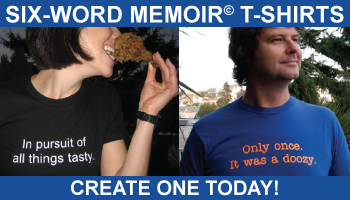 • Follow us on Twitter for one carefully selected Six-Word Memoir of the Day. • Join our Facebook group for an extra six fix.